My cravings for Middle Eastern flavors have not diminished, so I stopped by Noor, a brand new restaurant where the Broken Yolk used to be. It is on College Ave near the rotary. There are a handful of tables to eat at, but I saw a brisk take out business as I waited for my meal. 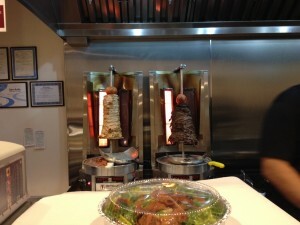 The menu is what you would expect: falafel, hummus, chicken or beef kebabs and shawarmas. 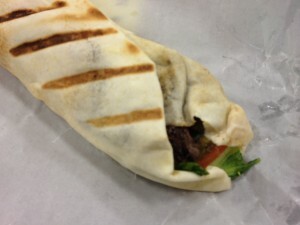 I ordered a beef shawarma wrap ($9) with extra garlic sauce (love that stuff!) and grape leaves ($1.19, each) to munch on as I waited. 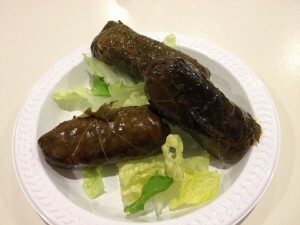 The grape leaves were excellent; the rice was tender and flavorful; not soggy and acidic, as some grape leaves can be. It is too bad they only offer a vegetarian version. I am also sad that they do not have lamb on the menu. My beef shawarma was okay; the meat was a tad dry, even with the extra garlic sauce. I think the beef shawarma at the Armenian Market was far better. I have read that the baba dip (eggplant) is outstanding, but who knows when I will be back to try it. Next to try: The Shawarma Place in Davis Sq.